IQS Directory implements a thorough list of impactor manufacturers and suppliers. Utilize our listing to examine and sort top impactor manufacturers with previews of ads and detailed descriptions of each product. Any impactor company can design, engineer, and manufacture impactors to meet your companies specific qualifications. An easy connection to reach impactor companies through our fast request for quote form is provided on our website. The company information includes website links, company profile, locations, phone, product videos and product information. Customer reviews are available and product specific news articles. This source is right for you whether it's for a manufacturer of mechanical impactors, pneumatic impactors, and cage impactors. You will receive numerous benefits when you select us as your impactor manufacturer. It is our goal to promote the growth of your business by supplying you with top notch pulverizing technology. We pay extra attention to the important details when producing our impactors. These devices can be utilized in a multitude of industries and we are your #1 source for all of your pulverizing needs. We offer fantastic impactors and our engineers are continuously upgrading the ergonomic features of our machines. These easy-to-use impactors offer hassle-free operation while providing the best size reduction results. We take pride in our craftsmanship which is why we will work with you long after the sale to supply you with any replacement parts or services. If you would like to know more information about our company then please give us a call today! We put an emphasis on the quality of our products. Our company is known for supplying some of the best impactors. We wish to forge a long-lasting relationship with your business. Our engineers are dedicated to making the best impactor solutions. If you would like to learn more about the tolerance levels of our solutions then please give us a call today! We are an accomplished company that provides our customers with superb impactor items. Our company has decades of experience and we offer multiple advantages with our impactor solutions. Our devices are sophisticated but easy to use. These machines are safe to use. If you have any questions then feel free to give us a call to learn more information! Impactors are a type of size reduction equipment that utilize impaction, which is a collision-wrought force, as opposed to sheer pressure to break apart or deform various materials. Impaction is defined as a force that is transmitted through the striking of one body against another, or a collision, in which crushing occurs as the result of the pressure created by the two opposing forces. Often used as a secondary method of pulverizing rather than a primary method, impactors are also often referred to as impact crushers. Able to be used on a wide range of materials, impactors are typically used to crush soft, non-abrasive materials such as phosphate, gypsum, coal, soft metallic cores and seeds, but they can also be used to crush hard, abrasive materials such as basalt, gravel, concrete and asphalt. However, they are best suited for materials of medium-hardness. As a result, there are numerous industries that utilize impactors, including road and bridge construction, for the impaction of building materials; mining, in the impacting of mined and quarried materials; industrial manufacturing, to impact various materials for use in further processing applications; and water conservancy, for the impaction of aggregates required for various applications. There are two main types of impactors: a horizontal shaft impactor (HSI) and a vertical shaft impactor (VSI). A HSI crusher consists of impeller bars, curtain liners and adjustable liner plates. The impaction process begins when the material reaches the breaker-plate, where hammers are fixed to the outer edge of a spinning rotor. Despite the different types, all impactors share the design feature of a solid metal cage, which functions to contain the materials and has openings on the bottom, end or side in order to let the pulverized material exit once it has attained the desire size. 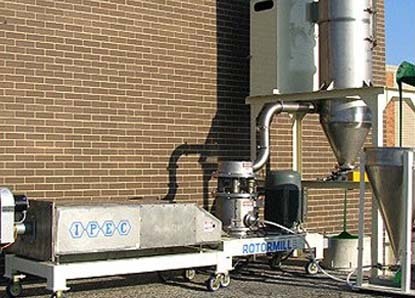 HSI crushers cannot be used for hard, abrasive materials and are best suited for soft materials such as weathered shales, dolomite aluminum and clay. 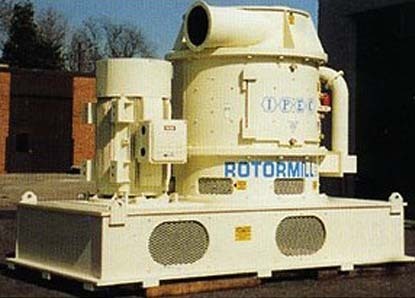 A VSI crusher is very similar in construction to a HSI crusher, but also features a high speed rotor and a crushing chamber that is designed to throw the materials against, thus impacting them using velocity rather than solely using surface force. As a result, VSI crushers are more high-powered and higher-efficiency than HSI crushers and are consequently better suited for harder materials such as magnesium sand, metallurgical slag, quartz minerals, limestone and bauxite.